ClipMenu is an application that helps you to manage your clipboard history. While running it records the last 20 (configurable) items you put in the clipboard and allows you to acces them later. You can also register texts you frequently use, like e-mail addresses, user IDs and so on, as snippets. 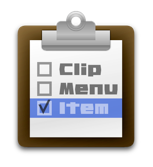 To paste a recorded item, you just pop up menu by invoking the shortcut key, and select a menu item. 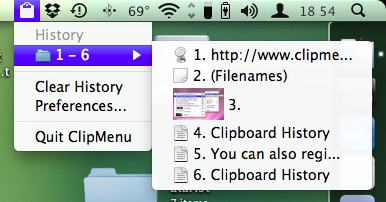 Useful as I often lose stuff that I've copied and not pasted by accident. Seems like a handy little app. Neat, that seems like quite an asset. This is great! Awesome post! Great post, I guess having diversity is good too. that could prove to be useful in the very near future. I'm pretty sure I'd die without this!